To introduce this subject, I will quote from Wikipedia. 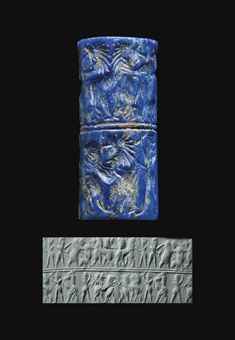 "A cylinder seal is a small round cylinder, typically about one inch in length, engraved with written characters or figurative scenes or both, used in ancient times to roll an impression onto a two-dimensional surface, generally wet clay. 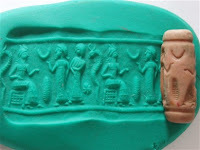 Cylinder seals were invented around 3500 BC in the Near East ... They were used as an administrative tool, a form of signature, as well as jewelry and as magical amulets; later versions would employ notations with Mesopotamian hieroglyphs. In later periods, they were used to notarize or attest to multiple impressions of clay documents.Graves and other sites housing precious items such as gold, silver, beads, and gemstones often included one or two cylinder seals, as honorific grave goods. "The seals themselves are typically made from hard stones and so are a form of engraved gem, but they may use glass or ceramics ... Many varieties of material such as hematite, obsidian, steatite, amethyst, lapis lazuli and carnelian were used to make cylinder seals. As the alluvial country of Mesopotamia lacks good stone for carving, the large stones of early cylinders were imported ... Most seals have a hole running through the center of the body, and they are thought to have typically been worn on a necklace so that they were always available when needed. 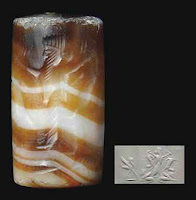 "Most Mesopotamian cylinder seals form an image through the use of depressions in the cylinder surface ... [and] are used primarily on wet clays ... [others] referred to as roller stamps, are used to print images on cloth and other similar two dimensional surfaces." Cylinder seals were one of the most widely adapted of the Sumerian inventions. They were invented early in Sumerian history, and their use spread throughout the Middle East, Egypt, and many other areas of the ancient world. 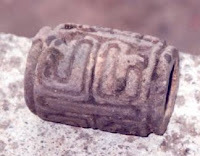 In this blog, I would like to discuss similar seals found in ancient America. Many of them have been found in the ancient ruins from Mexico to Costa Rica. They have even been found as far south as Peru. How did this technology get here? Was it imported from the Middle East, or was it an independent invention? I suggest that this handy device was one of the cultural items introduce to the Americas by the Jaredite people from their homeland of Sumer. They came from a highly civilized culture and brought many such amenities with them when they emigrated to the American continent. However, most scholars will insist that such things were independent inventions of the American Indian people. They feel that it is an affront to the intelligence and creativity of these peoples to suggest that they had to borrow them from other cultural groups. But historically, most cultural advances have been borrowed from the originators. The Greeks borrowed cultural advances from the Mesopotamians; the Romans borrowed from the Greeks; and later the Europeans from the Romans. To insist that each culture developed its own advances would be like saying that the Japanese independently invented the automobile. Culture, in almost all cases, has been derived from earlier groups and earlier inventions. The cylinder seals found in the American archaeological sites are an additional proof that the Indian civilizations found there were a transplanted culture and not an original evolved one. Below are some examples of cylinder seals found in American archaeological sites. 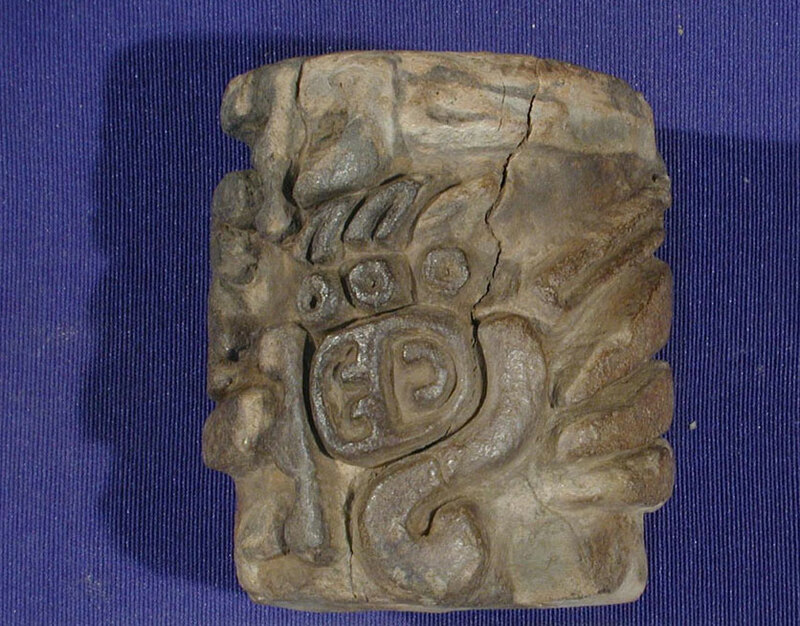 This is a seal found in the San Andres archaeological site in Mexico. It dates to the Olmec (Jaredite) era. Some believe that it is one of the earliest examples of writing in the Americas. This is a seal found near San Diego, Calif. 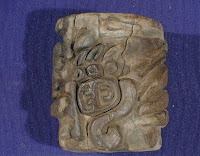 The following are Olmec era seals on display at the Snite Museum, Univ. of Notre Dame. Similar examples can be found in most other museums exhibiting Olmec era art. Such examples have also been found in many other areas of Central America. The following is a paper regarding the cylinder seals in Latin America written by Holly Bachand. Unfortunately, it is written in Spanish, but you can get a rough translation on the Internet. Investigaciones Arqueológicas en Guatemala, 2002 (editado por J.P. Laporte, B. Arroyo, H. Escobedo y H. Mejía), pp.527-538. Museo Nacional de Arqueología y Etnología, Guatemala. I have been researching other connections between Jaredite\Sumerian cultures. Incredible connections, artifacts, and information.